The venerable actor took the centre stage to introduce a performance by Bruce Springsteen but ended up bleeping about US President Donald Trump. 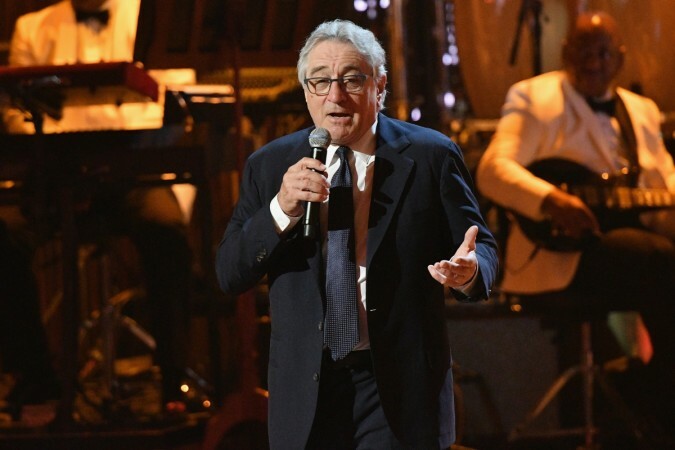 Actor Robert De Niro dropped an F-bomb at the politically charged Tony Awards 2018 on Sunday. The venerable actor took the centre stage to introduce a performance by Bruce Springsteen but ended up bleeping about US President Donald Trump. "First, I wanna say, 'f**k Trump. It's no longer 'Down with Trump,' it's 'f**k Trump,'" De Niro began his speech. Immediately, the audience erupted with claps, cheers and standing ovations. Though the video has been censored in most part of the globe, the news went viral within few hours—stirring a social media controversy. The veteran actor then introduced Bruce Springsteen for his performance. "Bruce, you can rock the house like no ones else, but what is more important in these perilous times is to make sure that you rock the vote," he added. Ever since De Niro's F-bomb comment went viral, celebrities and Twitterati have been praising the veteran actor for his courage and wittiness. #RobertDeNiro you rock! You are the very best. However, the comment did not go down well with a section of the audience. This is not the first time that De Niro is slamming Trump for his policies. Ever since the victory of President Trump, the actor has been openly criticising the politician and even alleged Russian's interference in the 2016 presidential elections. A report published on CNN even recalled the actor's profanity-laced speech at the at the National Board of Review Annual Awards Gala early this year. "Our baby-in-chief -- the j***-off-in-chief, I call him -- has put the press under siege, ridiculing it and trying to discredit it through outrageous attacks and lies. This f***ing idiot is the President. It's 'The Emperor's New Clothes' -- the guy is a f***ing fool ... our baby-in-chief -- the 'J******-in-chief' I call him,"De Niro said. At the Jimmy Kimmel Live in 2016, he even said that he would consider punching Trump if given a chance. Then, at the Chaplin Award Gala by the Film Society of Lincoln Center in 2017, he slammed Trump administration for ignoring arts and those in need. Now, the Tony Awards speech has triggered a huge rage among social media users dividing opinions. How do you reach to De Niro's F-bomb speech? Comment us! Arjun Rampal and girlfriend Gabriella Demetriades announce their first baby together!